Albert was the son of Edward and was raised on the family farm founded by his grandfather, Alonzo. 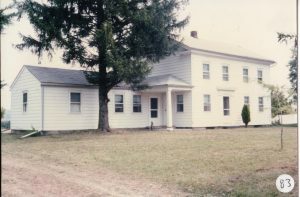 The farm consisted of 250 acres and included good level fields, a large wooded area and a stream, Mill Creek that flowed through the North end of the farm. Some pasture land was on the far side of Mill Creek. The farm was in Berlin Center, Mahoning County with the western border on the Mahoning – Portage county lines. Alonzo, his grandfather was the original owner of the land, acquired from the Connecticut Land Company. Albert had one older sister, Ola who was a graduate of Ohio University and taught at Southern High School in Youngstown. She married late in life and had no children. Albert attended Christytown School, a one room school on Leffingwell Road, just east of Helsel road. It was about 1/2 mile from their home. The old school house was used as a community hall through the 1930’s. He attended the school for 8 years, and then attended Alliance High School, boarding with his aunt. He was able to commute on weekends on the railroad that maintained a station in North Benton and was one of the few men in the area that graduated from high school. He had hoped to go to college as his sister had done, following his sister’s lead. Howeverr his father by this time was in his 70’s, and the rest of the family had moved away from the farm. As a result, Albert was obligated to stay to manage the farm. He married Belle and bought the adjacent farm, just over the line in Deerfield township. He managed and worked both farms until 1940 when two events broke up the arrangement. 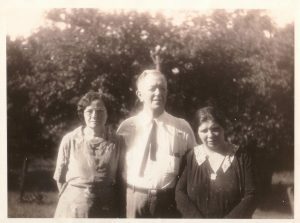 His sister took control of the old farm in return for caring for their father for the rest of his years (he was 90 at the time) and the government built the dam forming Berlin Lake which flooded substantial portions of both farms. The old farm had a large stand of hard maple trees which supported a maple syrup camp every spring. He made about 100 gallons of syrup each year. However, the primary cash crop was milk, and between the two farms, he kept about 30 dairy cows in addition to 40 or so sheep, 5 work horses and a horse to ride named Dan. Dan was a very fast horse that Albert had rode for transportation during his teen years. The horse lived to be 44 years old. Dan was trained to accelerate into a run as soon as the rider swung his legs over his back, so the rider had better aim for Dan’s neck as that was where his back would be when properly seated. We never used a saddles. 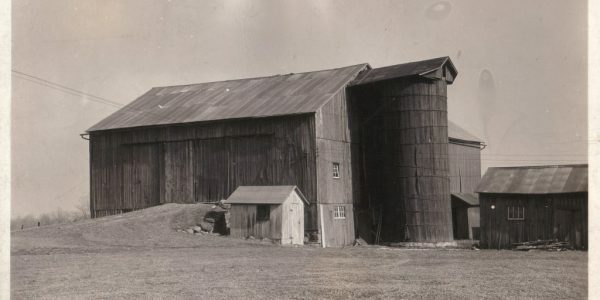 After losing control of the old farm and with 35 acres lost to Berlin Lake, he spent the war years as a carpenter, first building army barracks at new Army bases in Pennsylvania and then at Taylorcraft Aircraft Company in Alliance packing aircraft parts such as ailerons and rudders to be shipped to larger aircraft manufacturers. In the 1950’s, he sold much of his land as lakefront lots and retired although he still planted and harvested crops on the remaining land for many years. He built a house in Florida for winter and summers on the farm. After Belle died, he remarried Helene while still maintaining the same lifestyle until has last 2 or 3 years. Belle Strong was a small-town girl, raised in Lodi, Ohio. This was a typical mid-west town with a large square surrounded by retail stores with a few hundred houses within waling distance. The McConoughey’s lived about a half mile from the square in a two-story house with a wraparound porch, a vegetable garden in the back and surrounded with a variety of trees. The property included a small barn and a chicken coop. Belle’s mother (Mary Stevenson McConoughey) died a few days after she was born from complications resulting from the birth. Her father, Curtis McConoughey married Dora Miller a year later. Belle had one brother, Merle who was 3 years older. Her brother, Merle, graduated from Ohio State University as a mechanical engineer and worked at the Naval Aircraft Factory in Philadelphia during WW II. He was exposed to toxic gases during his employment and suffered from lung damage for the remainder of his life. He moved to Tucson, AZ for the dry climate for the last years of his life where he died in 1933 at the age of 39 from complications of his exposure to toxic gas during the war. Belle became a teacher while still in high school, as these were war years with a shortage of teachers. She was drafted to teach first grade as a part of her senior year of High School. She attended Wooster College for the summer session to obtain qualifications to teach in the one room school at North Benton. She taught there for 2 years and then was transferred to Berlin Center School, also a one room school. Each summer she attended college, two years at Wooster and two years at Kent Normal School, which had just opened. Later, when she resumed teaching during WW II she went back to Kent State each summer, although she never obtained a degree. She married Albert and took over the duties of a farm housewife. It had to be a shock for her to suddenly become responsible for the cooking, canning, gardening and all the rest which comes with the farm. although during her teaching career, she boarded at a nearby farm operated by Jake and Helen Miller. Belle and Albert raised 3 children and they hired one and sometimes two hired men who also lived in the house. She typically canned about 100 quarts of tomatoes, and similar quantities of other fruits and vegetables, including corn, beets, peas, string beans, cherries, peaches, pears and apple sauce. The cellar also normally held a couple of barrels of cider, much of which had become vinegar. The cellar also had large bins to hold potatoes, apples, and other food that could be stored there through the Fall and Winter months. She helped maintain a large garden, nearly the size of a football field. An orchard provided a large variety of apples, pears, and cherries. I larger garden was planted for sweet corn, melons, strawberries and even more tomatoes. When WW II began, teachers again became scarce and she took on the job of teaching 5th and 6th grades in the Deerfield school system. She taught there through the war and continued until the school was closed for consolidation with adjacent townships. She enjoyed teaching and was known as a good teacher. After retiring from teaching, they spent summers at the farm and winters at the house they built at Palmetto Point, FL. She died from heart disease when she was 67 years old.